An extensible low-code software development platform and ecosystem. 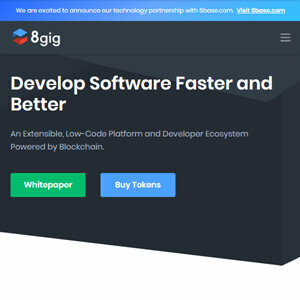 8gig is a combination of a low-code development platform, decentralized developer network, and token-powered economy. Through our integration with the 8base Serverless Chassis, we provide a global architecture and operating environment to easily build and deploy blockchain and traditional, non-blockchain software. The Serverless Chassis offers developers access to a robust, enterprise-grade backend-as-a-service that encapsulates most of the complex tasks related to building and hosting softwareServing the ecosystem is our decentralized 8gig Developer Network. This network allows developers to create their own innovations and extend the capabilities of the platform by being distributed in our Marketplace through a crowd-sourced approach, as well as respond to one-time development requests using fully-verifiable reputation scores assigned to all users on the Network.Fueling these interactions is the Piece of 8 Token. Through a user-friendly staking mechanism to align incentives of different parties, developers on the 8gig network are incentivized to innovate and respond to development gigs. These tokens also facilitate the administration of a token-curated registry of extensions made to the Serverless Chassis. Customers can also stake tokens to receive ongoing discounts as they utilize Serverless Chassis to host applications on the platform.8gig’s unique combination of technology, developers, and token economy helps to make digital transformation accessible to businesses of all shapes and sizes, closing the gap between dreaming of an innovation and making it a reality.